Brilliant news just in from ol’ Blighty where Aussie dance duo Empire Of The Sun continues to kick goals with the British public. 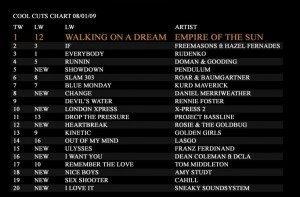 Their debut single ‘Walking On A Dream’ is now sitting pretty atop the UK Cool Cuts chart, a move up of eleven places on last week’s No.12 finish. It’s the outfit’s first No.1 on any chart anywhere in the world and just goes to show that the success of their album, which is being rush-released in the UK in mid February, is virtually guaranteed. Brilliant news for Luke and Nick and we congratulate them wholeheartedly on their extraordinary success. Great news! But this post is a little misleading to the uninformed – To those who are unaware, the ‘Cool Cuts’ chart is basically the equivalent of the ARIA Club Chart. 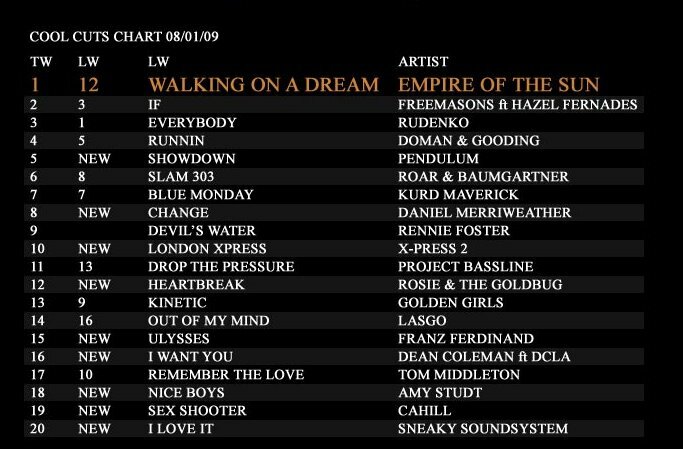 DJ’s submit what records they’re playing out and a list is compiled.